Ihsahn teaches you how to explore the range and new challenges offered up by an eight-string guitar. "You should play guitar for yourself." Emperor's Ihsahn sits down for a Q&A with Guitar World. 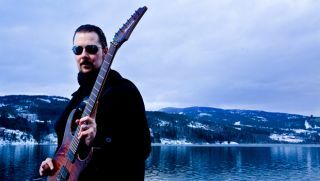 Ihsahn Playthrough Videos: "My Heart Is of the North" and "Frozen Lakes on Mars"
Founding Emperor guitarist (and former Guitar World columnist) Ihsahn has just unveiled two new playthrough videos. Why ain’t six strings enough? This was the question we posed to one of guitar's all-time greats in our September 2012 cover story. Exclusive Premiere: Listen to Ihsahn's New Single "Introspection"
Be among the first to hear this new track from black metal legend Ihsahn's forthcoming CD, Eremita. Dear Guitar Hero: Submit Your Questions for Ihsahn! Here's your chance to ask the founding Emperor guitarist and progressive black metal pioneer anything you want. The Norwegian black metal legend gives his thoughts on shred guitar. Ex-Emperor frontman Ihsahn issues his second video lesson from his popular Guitar World column. Ex-Emperor frontman Ihsahn issues his first video lesson from his popular Guitar World column. Be among the first people to preview the debut single, "Frozen Lakes on Mars," from ex-Emperor frontman Ihsahn's forthcoming solo record, After. His influential black metal band may have reached the end of its line, but with his new solo album, angL , former Emperor guitarist Ihsahn continues his reign as Norway's progressive metal monarch. angL set for May 27 release.